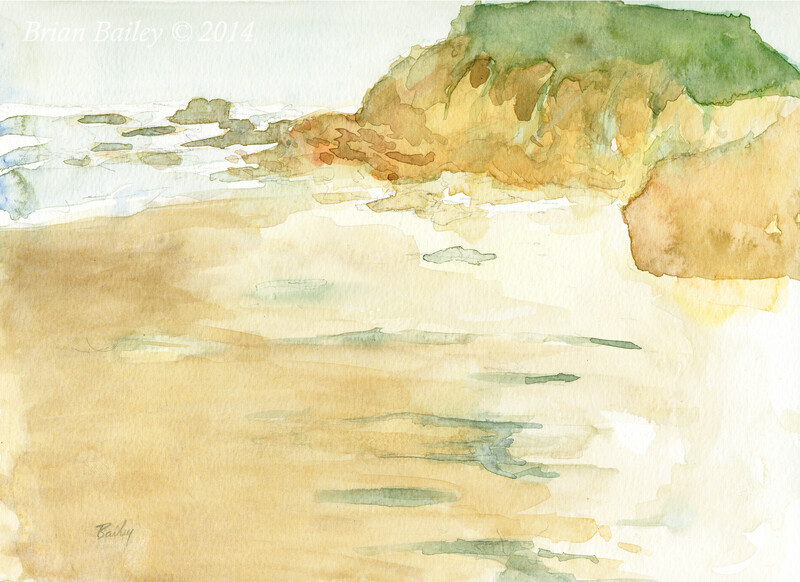 I went out last Friday to the beach about 30 miles south of San Francisco to spend some time painting and meditating. I don’t follow a particular school of meditation practice but find that being alone on the beach and trying to be present has a lot of value. The waves come in… the waves go out… and it becomes obvious that my brain can easily get clogged up with thoughts about the past and future. I need to take a few minutes, breath and be right here, right now. Then the world comes more into focus and I feel better about what I’m doing. Painting can have a similar effect. I think a lot of activities can help you to become present and let go. Running or riding a bike can also force your brain to pay attention to what’s in front of you and it can be powerful. I want to improve my painting and I work hard at it but, at times, I get in my own way. Working hard and trying to improve can easily bleed into judgement and self doubt. The greatest strides that I’ve made in painting or anything else have mostly come out of letting go. Improvement comes from getting to the point where I’m working hard but I’ve abandoned the idea that what I’m doing is either good or bad, I’m just doing it. And that’s where I’m at, painting and writing this blog, regardless of any judgement or doubt. Thank you to everyone that reads it for your time and encouragement. Here is a painting from that day at the beach.